We recently had a customer looking for advice on a science fair project that depended on altimeter measurements from 10 flights of each of 3 Crossfire model rockets. This kind of high-stakes flying requires more durable build techniques than most model rocket builds, but the changes are not difficult, and will result in more consistently successful flights. Many rockets like the Crossfire use a piece of paper glued inside the motor tube near the top, but this kind of shock cord attachment can fail after several flights, resulting in separation of airframe and nose cone. A sturdier and more reliable method is to attach a Kevlar shock cord directly to the motor mount.This article will show you how..
Start with Kevlar Shock Cord, which is a durable, flame resistant fabric cord that is great for this purpose. For a foot-long model rocket like the Crossfire, use a 3 foot section of Kevlar shock cord. Though the 3 foot length appears to be a bit excessive, it allows the Kevlar cord to stretch slightly to help absorb the shock of the nose cone ejecting from the rocket body. You can choose to attach the elastic shock cord that comes in the Estes kit, but it is not necessary. Before you assemble the motor mount, it may help fit the parts together if you carve a groove in the inside of the forward centering ring. This will permit the Kevlar cord to fit easier between the motor tube and the centering ring. Don't cut more than half way through the centering ring. Next, make a 3 inch loop with one end of the Kevlar shock cord and tie an overhand knot to secure the loop. Slide the loop through the centering ring and position it in the centering ring groove. Then thread the motor tube through the loop and into the centering ring. This isn't the final position; follow your assembly instructions for the kit you're building to finish the motor mount. In the case of the Crossfire kit, the motor mount winds up looking like this. 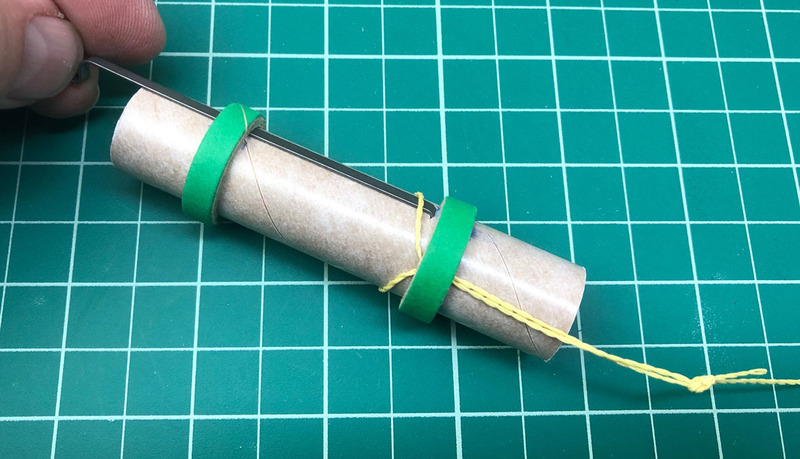 You can glue the shock cord around the motor tube, but do be careful if your motor tube leaves a gap between the top of the motor and the forward centering ring; you want the shock cord to pull on the part of the motor tube with the motor inside it. It can cut through a bare paper motor tube without a motor inside. Once your shock cord is secured to the motor mount, you can coil up the shock cord and stow it inside the motor tube until you have installed the motor mount in the airframe. Once the glue is dry, you can shake the shock cord out the forward end of the rocket.